One of the signs of success is when you outgrow your last cramped quarters and can afford a “real” building. This happened to us at SuperMac when our sales skyrocketed. At SuperMac we were excited to finally get out of the crummy tiltup we had occupied since the company emerged from bankruptcy. Now with cash in hand, we wanted to fix everything that seemed broken and annoying about our office environment. We made what seemed to be a series of logical and rational decisions about what to do with our next office building. Engineers were packed in cubicles or desks right on top of each other? Now every engineer can have their own office. We can’t bring customers to this rundown building. The new building needs to reflect that we’re a successful and established company. The lobby of the last building didn’t “represent” the company in a professional manner. Lets “do it right” and have a lobby and reception area that projects a professional image. We had used, crummy and uncomfortable furniture. Lets get comfortable chairs and great new desks for everyone. None of this used stuff. The last building has stained carpets and walls that haven’t been painted in years. Now we can pick out carpets that look good and feel good and we can have clean walls with great artwork and murals. We didn’t have enough conference rooms. Lets make sure that we have plenty of conference rooms. Everyone left the building for lunch. We need our own cafeteria so employees don’t have to leave the building. Once the commitment to fix everything wrong was in place, we were off and running on the design phase. We hired an interior designer and a great facilities person to manage the process. The exec staff started meeting about the design of the new building. The company decided that now engineers can have their own offices rather than cramped cubes. The staff got involved about what color the carpet and walls are. And there was lots of discussion of what style of furniture is appropriate. Our exec staff spent time worrying about who had the corner office, and what departments had the “prime” location. (I was great at “office wars.”) There was lots of talk about the importance of natural lighting and maybe we needed our own cafeteria. And even better, marketing got to design the graphics for the lobby and hallway (bright and colorful neon) to better represent the color graphics business we were in. We kept the board informed, but they didn’t have much to say since business was going so well, and a new building was needed to accommodate the growing company. This is when things started to go downhill for SuperMac. The most obvious problem; the time we spent planning the building distracted the company from running the business. But there were three more insidious problems. While offices for everyone sound good on paper, moving everyone out of cubicles destroyed a culture of tight-knit interaction and communication. Individuals within departments were isolated, and the size and scale of the building isolated departments from each other. We started to believe that the new building was a reflection of the company’s (and our own) success. We took our eye off the business. We thought that since we in such a fine building, we were geniuses, and the business would take care of itself. While our competitors furiously worked on regaining market share, we were arguing about whether the carpets should be wool or nylon. The result was not pretty. An upgraded new building is a premature transition away from a startup culture. It’s a tipping point to a big company culture. This is a culture and values issue worth fighting over. Letting this happen is a failure of a board. If the management team is thinking they’ve made it, the new building is just symptomatic of a company heading for a crash. It’s a company that’s lost sight of the values that got it there. It was early 1991 and Apple’s software development team was hard at work on QuickTime, the first multimedia framework for a computer. At the time no one (including Apple) knew exactly what consumers were going to do with multimedia, it was still pre-Internet. But the team believed adding video as an integral part of an operating system and user experience (where there had only been text and still images) would be transformative. But Apple had planned to announce and demo QuickTime without a way to get video into the Mac. They had this great architecture, and Apple had figured out to get movies into their own computers for a demo, but for the rest of us there was no physical device that allowed an average consumer to plug a video camera or VCR into and get video into a Mac. A month or two before the QuickTime public announcement in May, the SuperMac hardware engineers (who had a great relationship with the QuickTime team at Apple) started a “skunk works” project. In less than a month they designed a low-cost video-capture board that plugged into the Mac and allowed you to connect a video camera and VCR. But to get video to fit and playback on the computers of the era, they needed to compress it. 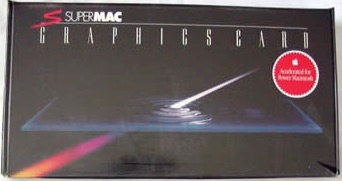 So SuperMac engineering also developed video compression software, called Cinepak. The software was idiot proof. There was nothing for the consumer to do. No settings, no buttons – plug your camera or VCR in and it just worked seamlessly. (The Cinepak codec was written by the engineer who would become my cofounder at Rocket Science Games.) It worked great on the slow CPUs at the time. Engineering gave us a demo of the prototype board and software and asked, “Do you guys think we can sell a few of these boards?” Remember, this is the first time anyone outside of Apple or the broadcast industry had seen moving images on a Macintosh computer. 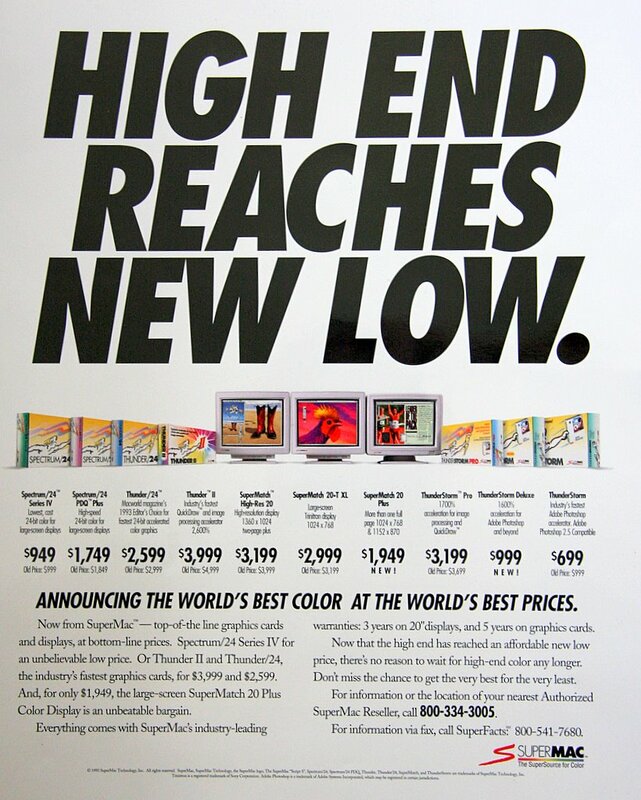 (A company called Avid had introduced a $50,000 Mac-based professional broadcast video editing for two years earlier. But here was a $499 product that could let everyone use video.) Our engineers connected a VCR, pushed a button and poured in the video of the Apple 1984 commercial. We watched as it started playing video at 30 frames/second in a 320 x 240 window. Up until that moment Quicktime had been an abstract software concept to me. But now, standing there, I realized how people felt when they saw the first flickering images in a movie theater. We must have made them play the demo twenty times. There were a few times in my career I knew at that moment I was watching something profound – (Holding the glass masks of the Z80 microprocessor. My first IPO at Convergent. First silicon of the MIPS RISC processor.) I stood there believing that video on computers was another – and equally as memorable. Everyone laughed at such an absurd number. Now, in hindsight, with a spigot, you’re actually pouring stuff out, and, in fact, the ad actually shows you stuff pouring stuff out, but into your Mac. It made no logical sense (a fact engineering reminded us about several times.) 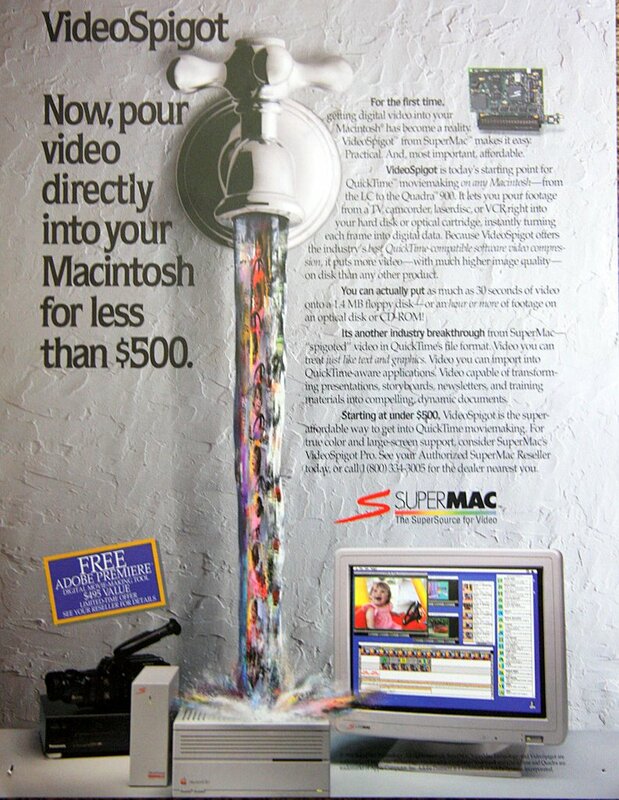 But it made the point that this device could pour video into your Mac and consumers instinctually got it. Our answer was, “People will love this thing, as long as we don’t oversell the product.” We knew something our CEO didn’t. We had seen the reactions of people playing with the prototypes in our lab and when we demo’d it to our sales force. When we saw our salespeople actually trying to steal the early boards to take home and show their kids, we knew we had a winner. All we had to do was tell customers they could get video into their computer – and not promise anything else. But the rest of the management team really skeptical. We kept saying, “Don’t worry, we’re going to sell thousands of these.” Little did we know. We launched the product with this ad that said “Video Spigot, now pour video into your computer,” and this just hit a nerve. We sold 50,000 Video Spigots in six months. Question: Were you the person who bought the board? Answer: Yes. Question Are you happy with the board? Answer: Oh, it’s great. Question Are you using the board? Answer: No. Question And … wait a minute, you’re not using it anymore? Answer: No. Question So do you want a refund? Answer: No, no. Question Why not? Answer: It did everything you said. We loved this product. It didn’t do anything else. People loved it, they used it, and they put it in their desk drawer. We accidently had a product with the Novelty Effect. I didn’t recognize the behavior at the time, but anyone who loves technology and gadgets has at one time or another has bought a technology toy – USB memory sticks, iPod Shuffles, umbrellas with LED lights, alarm clocks that talked, Flip Video Cameras, etc. – used them for a while and then stuck them in the drawer. The product does what it said it would, and amuses you for a while. You don’t regret the purchase price because you got entertained and then you lose interest – the Novelty Effect. As these boards are flying out the door, one of the software engineers at SuperMac got to thinking about what did you do with video once you did get it into a computer – so he wrote the first Quicktime-based video editor which we called ReelTime. But you probably never heard of ReelTime. You may know it by its final name. Adobe renamed ReelTime to Adobe Premiere. 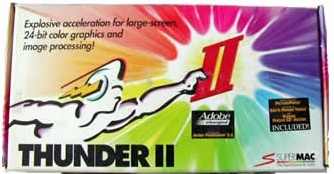 And Randy Ubillos, its author, went on to author Mac-based video editing software for the next 18 years. His team wrote what became FinalCut Pro at Macromedia; it was bought by Apple, and now he’s at Apple doing new versions of iMovie. So an unintended consequence of the VideoSpigot, and to the benefit of video editors everywhere, video editing for the masses was invented at SuperMac. Thanks to Bruce Leak and the Apple QuickTime team, Peter Barrett for Cinepak and Randy Ubillos for giving us video editing on the Mac. It was fun watching it happen. We decided to work with our engineering department to create the Potreo benchmarks because we really wanted to see how our boards performed with the four applications customers told us that they used; Photoshop, Quark, Illustrator and PageMaker. These were applications we had never seen or ran before when the boards were designed. As we ran our tests, our engineering team found ways to improve our graphic boards performance for these applications and they made revisions to the boards firmware (its operating instructions.) The goal was to make our boards run really fast on customer applications – the benchmarks just reflected that. It would have been easy for marketing to skip all of this and just write a set of benchmarks that made us look good. It would have been possible to have our graphics boards recognize a benchmark and just speed that test up, but not really be faster in the real world. All these shortcuts were available to us. And we decided not to. And here’s why. Even in the smallest of companies ethics matter. Culture matters. As a private company you can decide that winning at all costs is your culture. You can decide that coming in first at all costs is your culture. Unless your board of directors is looking over shoulder they may never know that’s what you’re doing and no one will tell you to stop. Don’t confuse or rationalize “relentless and focused” with cheating. Shortcuts are easy. But besides being morally wrong, in the end they come back to bite you big time. (Think about the baseball Steroid scandal, Tour de France doping scandal, housing bubble, etc.) When your employees see that it’s “an anything goes” culture you’ll find unethical behavior occurring that you will regret. And in a big company most of it is illegal and can have enormous consequences. A final note. I’m sure at Enron and Madoff there were plaques and posters about ethics. Just remember ethics and values are about what you practice when the going gets tough. It’s the decisions that you make that might cost you an order, a sale or a higher stock price. Do the right thing. It pays off in the end.